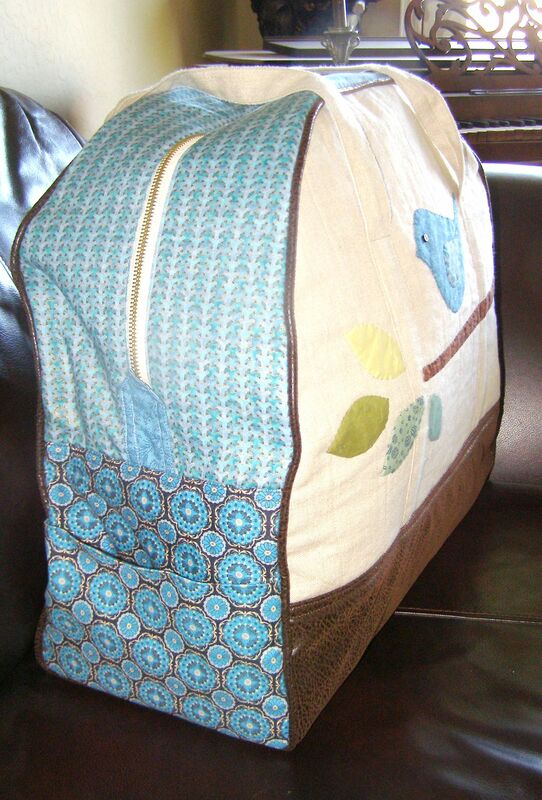 The sides of the Scrap Bag Bag (click for pattern) can be embellished in any number of ways. 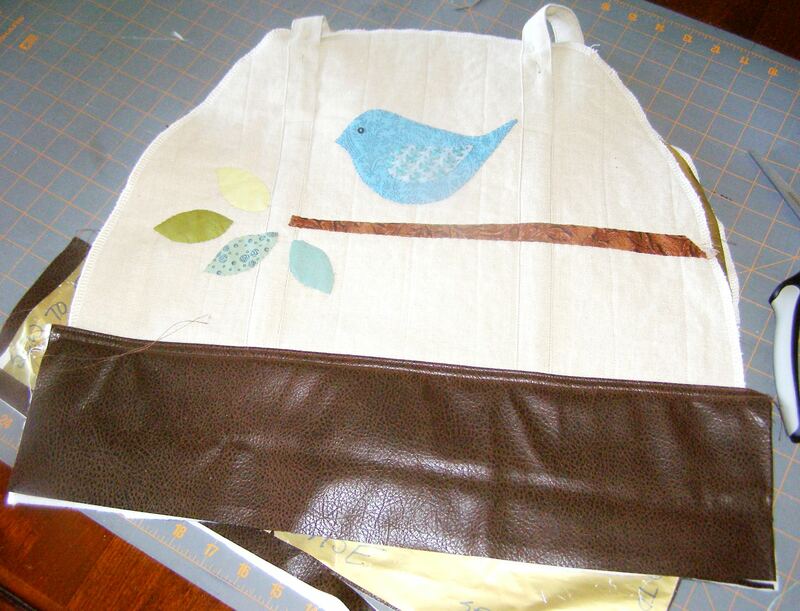 The “bird on a branch” graphics that seem to be everywhere right now inspired me, so I decided to applique one such design on the bag. The Stash was providing some natural colored linen and some brown not-really-leather as the background fabrics. Initially the bird on a branch design included in McCalls 6299 curtain pattern was selected. While the color scheme was maintained, I decided against the rather plain bird. There must be thousands of bird graphics on the web. Inspiration abounded! While digging through The Stash, I came across a single 6″ square of blue fabric from the 80’s. 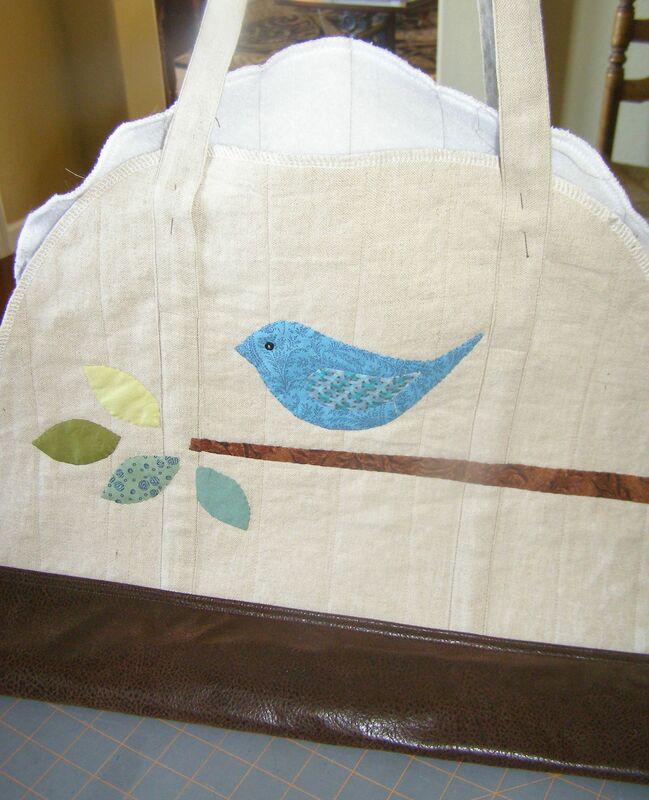 Jinny Beyer, I believe – it was the perfect fabric for the bird. So then the hunt was on for coordinating fabrics. The leaves were cut from fabric scraps. The olive green from a piece of my Grandmother’s Stash. Final applique – redone and redone! Laying out the applique required trying several options, including that in the photo above. 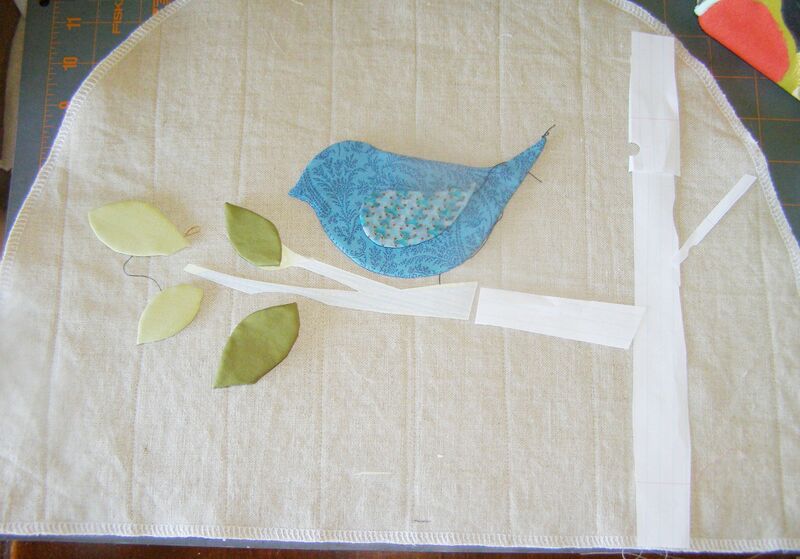 I actually planned on the bird facing the other way, but turned the applique template upside down by mistake! The selected design was simple and modern….and was redone at least three times! The first leather-esque base pieces had to be cut off and the branch and leaves applique unstitched because I forgot the handles! Self-fabric handles of the linen were sewn so as not to visually interrupt the applique design. Outer assembly complete and ready for piping. Then the new leather-esque base was attached. I believe the actual content of the leather-like is PVC. The iron-on batting required an iron setting far in excess of that noted to cause PVC melting, but with a press cloth (and patience) it eventually adhered. 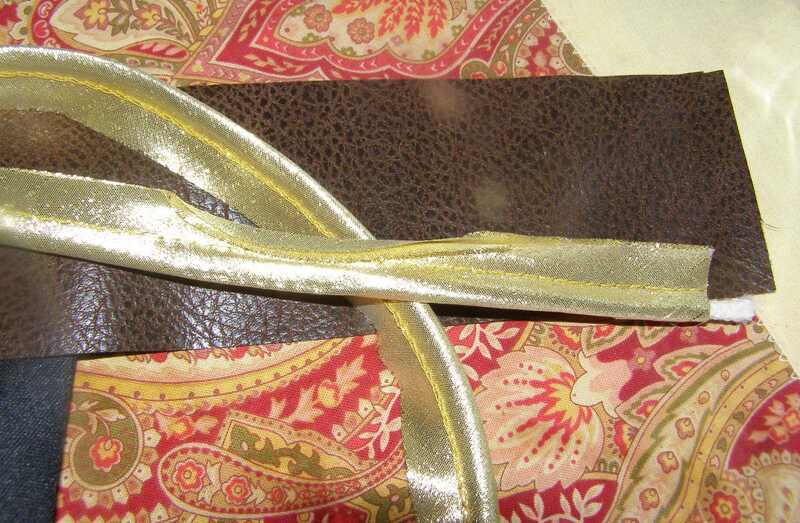 To make the piping, 2″ strips of the PVC were sewn over some Stash gold lame covered piping. 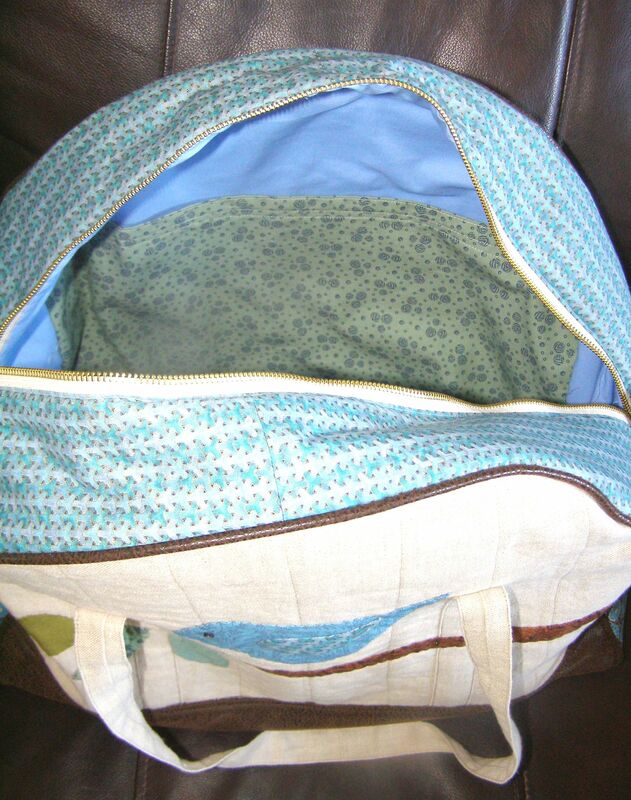 The top, sides and lining were sewn from Stash fabric. The 24″ metal zipper was a upholstery zipper also from The Stash – it sill had it’s 50 cent clearance price tag! The large inside pocket was designed as a lingerie pocket, but seems to be just perfect for transporting an extra pair of shoes! The outside of the bag also has pockets. The end pocket is sized for a boarding pass. 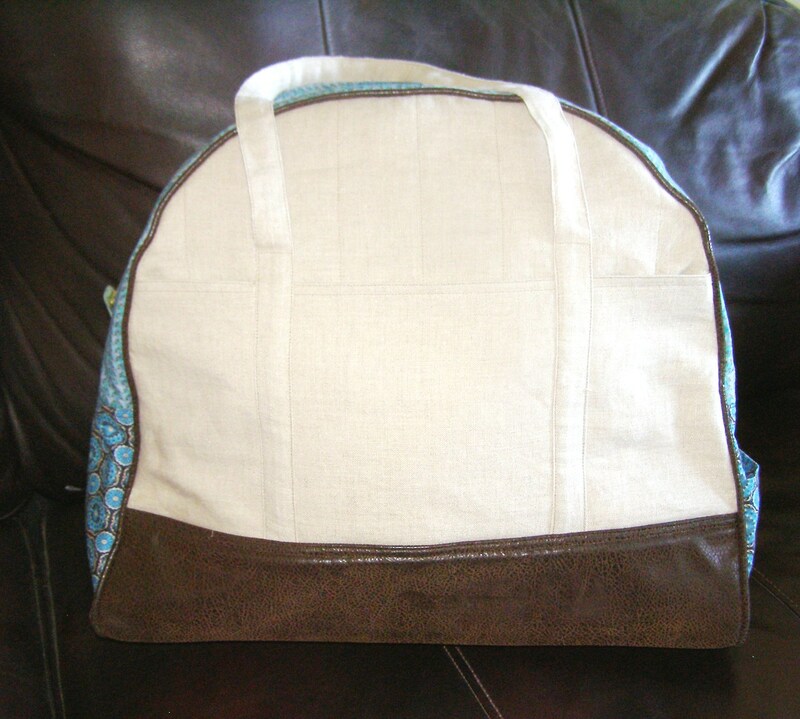 The linen side has three pockets sized for ereaders and phones. I haven’t decided if the Stash Couture and Secure Luggage Tag for this bag will be of the leather-esque or the blue print fabric. 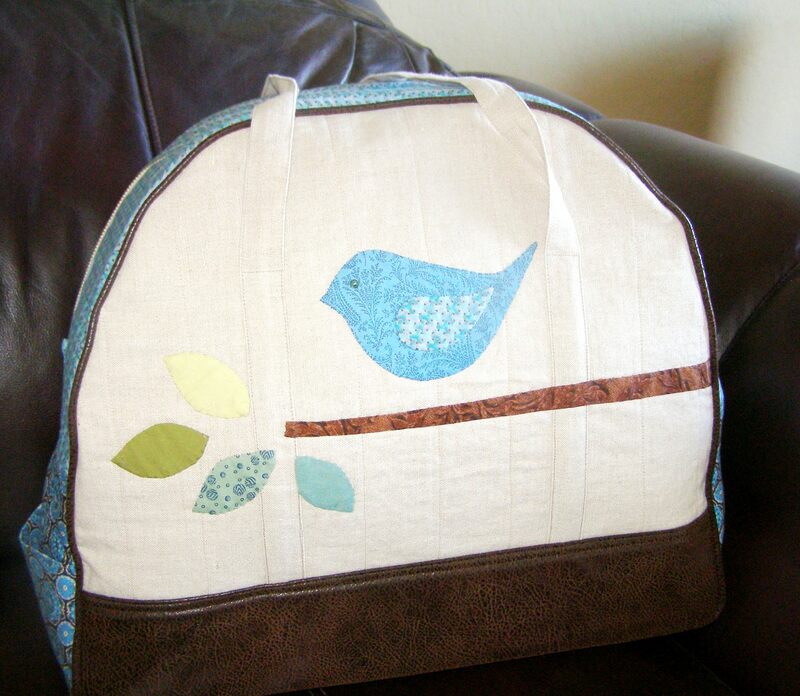 This entry was posted in Accessories, Bags, Embellishment, Purses, Scrap Couture, Sewing, Stash Couture and tagged Bird applique, Scrap Overnight Bag, Sewing Overnight Bag. Bookmark the permalink. That is a really cute bag. I love it!